These tea bowls were created in China during the Tang Dynasty and gained popularity in the Song Dynasty (960-1279). In China, they are known as "Jian Zhan" but they are more widely known as Tenmoku (Japanese) nowadays. 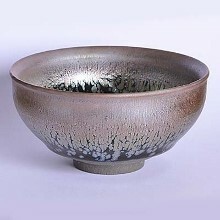 Tenmoku has been part of the Japanese tea ceremony since the 13th century. They are also suitable for brewing Chinese Green, White, Yellow and Black teas. These tea bowls were created in China during the Tang Dynasty and perfected and popularized during the Song Dynasty (960-1279). Its originally called "Jian Zhan" in China but more commonly known as Tenmoku (Japanese name) today. It has been used in Japanese tea ceremony since the 13th century. Each piece is skillfully hand-crafted. There might be slight variations in shade, color and/or pattern but exceptional quality of product is guaranteed.